MyThemeShop launched in 2012 and it is one of the names that will surely pop up when you search for the WordPress themes. It is a popular themes club that has over 350.000 customers and over 5000 affiliates. But if you just want one theme, they offer that option too. They even have free membership. But does all of this sounds too good to be true, or there is nothing really wrong? While signing in you can connect in one of three ways. Old school with email or through Google or Facebook account. Since we picked the email route, we got an email that provided us with our username and password and the link to where we could download themes and plugins and since there are free themes, you can start out without any obligations. For a start, we opted out for the free version of one of their more popular themes, Socially Viral. The process is usually, you download the theme, upload it to WP in the .zip format and after that, you will have (their words) to install a few plugins. After that, you are ready to go or free to tweak things to meet your tastes. 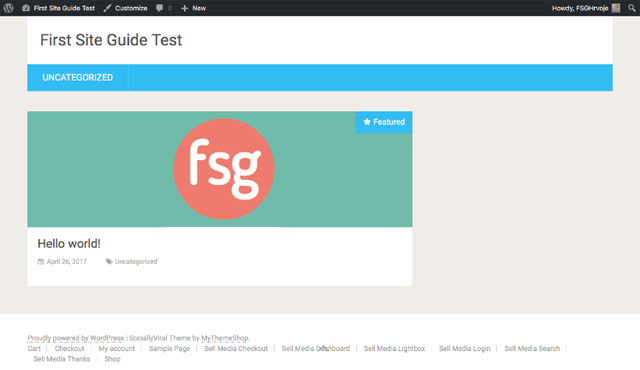 One of the best things about the initial phase of MyThemeShop is that there are free themes and plugins. While they are a minority of products, it is a nice touch. Sometimes life can get crazy busy and 30 days money back guarantee can fly by like spaceship at a warp speed. This way you will have basically the rest of your WP life to see if MyThemeShop is or is not for you. But with the very easily navigated Member’s area and affiliate program that offers one of the highest commission percentages of any WP Theme company on the net (whooping 55%) it all sounds pretty good. After you installed your desired theme, you might search for the customization panel, because there used to be one. Unfortunately, there isn’t anymore, because WP required them to remove it and focus on the native WP customization option. This was seen as a step back for many users. But if you do have a WP site, it is firstly a WP site, then secondly everything else. On their community forums, they will recommend you what third party plug-ins to use if they do not have their in-house solutions. But all in all, if you are only dependent on the WP customization, ultimately, you won’t have that much of a range. 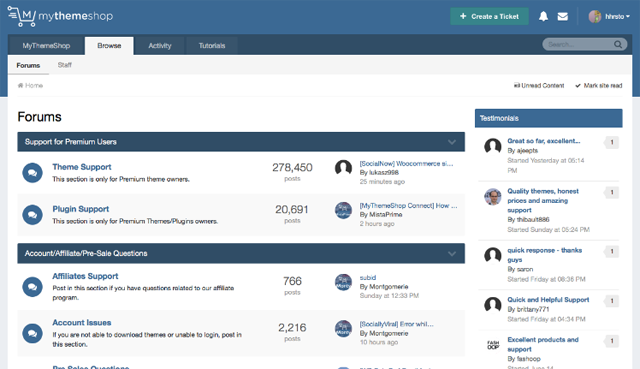 However, when it comes to themes and plugins, you will have several options. Besides already mentioned free account, you can buy themes individually, and with it, you will have priority support. But the best option is Extended membership club. With it, you will pay a single price and get access to all of their premium services and products. So if you are a developer, or you have multiple clients that you tend to, this will be your best option. And with their simple to use approach, we are sure that you won’t have any problems managing numerous projects at once. Their designs might be up for a discussion, but their coding is great. Themes load fast and their SEO practices are good. 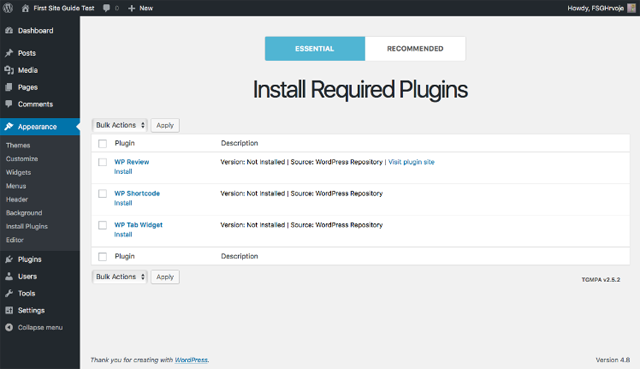 While signing in you will be told that there are three essential plugins that you just have to install, but that is not true. Your website can function without them. But they are quite handy and they also have premium versions. But if you want premium support, you will have to pay a yearly fee. Not great, but it is not as expensive as you might think. When it comes to overall design and graphics, well, we must say that MyThemeShop needs an update. We can’t deny that there are beautiful themes and they do boast with Musical as best free WP theme this year for entertainment, but to be honest, there are paid and free themes that could use some freshening up. On one hand, you have stylish and modern themes like Corporate, School or Launcher, but there are a lot of similar ones like Woodie and Swift, or the ones that could use a freshening up via new fonts because a lot of fonts are just OK, but not eye-popping. But to be fair, there are a lot of specialized themed, for different content, even e-commerce, with several themes dedicated to WooCommerce plugin. There are currently 112 themes to pick from, so there are really small odds that you won’t find what you are looking for. And some themes have multiple variations that can be quite different from each other, so we can even expand that number of themes. For example, Feminine theme has 6 variations and only 2 of them share the same color scheme so they almost look like 6 different themes. But not all themes are this lucky and they could benefit from expelling some older looking ones. To conclude, they have some great and some “meh” looking themes, but each one comes with a narrated video tutorial, so thumbs up for that. When it comes to support, they do not have live support if you are on their free account. There is ticketing system, but their most prominent support system is community forum. And it is a lively and active one that was constantly added on while we tested it out. That means that their community is engaged and thriving, which is always a good sign for any kind of company. As we mentioned if you are free user, you will get limited support. If you buy their membership or any of the themes, you will get premium support, which will give you priority on one on one help. Then you will have to pay on a regular basis to get the continued support. The main difference is that with membership you will have to pay it each month and with single theme purchase, you will have to pay it yearly. It is a give and takes, but when a community is engaged, things generally look good. 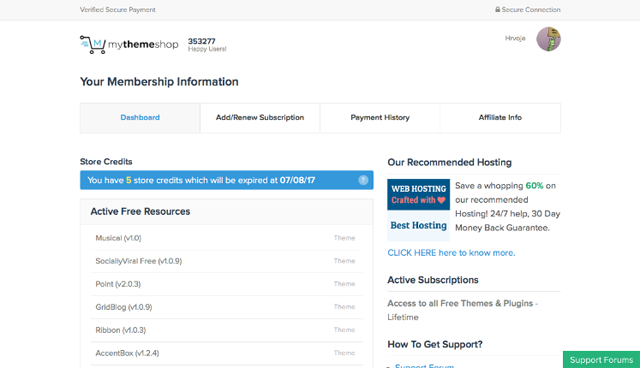 Free theme will give you access to their membership area, free themes and plugins, updates and you can remove their copyright text, which is not always an option. A single product will cost you $29-$59. 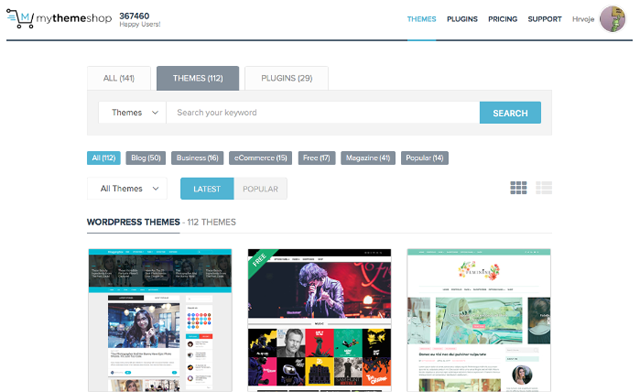 You will get you everything from free plan, plus access to paid premium themes and plugins and premium support. If you want to extend premium support and updates beyond one year from the date of purchase, you can pay additional $19 per year. Extended membership will cost you a one-time $89. You will get all of their premium themes, plugins and premium support for clients and projects. If you want to extend premium support and updates beyond one month from the date of purchase, you can pay additional $19 per month. When it comes to MyThemeShop, they are somewhat of a middle ground of WP premium themes. To get the bad things out of the way immediately, there are a lot of themes that are similar or a bit outdated looking with very little customization options. They could benefit from thinning out the herd in our opinion. However, there is a lot to choose from and a lot of themes have variants that can look quite different. They are fast and SEO optimized and with their extended membership club, you can get a lot for a little pricing. 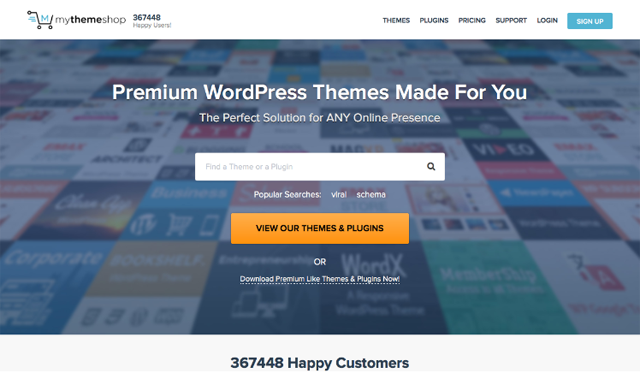 There are a lot of useful plugins and if you have multiple clients and need for multiple themes, their extended membership club is a great deal. Support is good and their community is thriving. Although there are some things that we would like to see them do differently, with a lot of good things and free membership, it would be irresponsible of us not to tell you to at least test them out and see if they are a good fit for you.